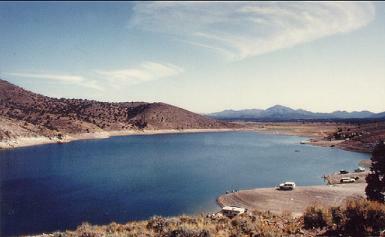 Newcastle Reservoir in located in the northern foothills of the Pine Valley Mountains in southwestern	Utah. It is a moderate size impoundment of a wide stream valley. This reservoir should not be confused with Grass Valley Reservoir, a small reservoir high in the Pine Valley Mountains, listed on some maps as New Castle Reservoir. The reservoir shoreline is privately owned by the Newcastle Irrigation Company with unrestricted public access. Land outside the immediate reservoir area is owned by the BLM. Newcastle Reservoir is located on an improved secondary road between the communities of Newcastle and Pinto. Access is easiest from Newcastle. From Utah Hwy 56, travel 5 blocks south in Newcastle and turn east (left). The road winds up a wide canyon for about 1.5 miles, then climbs the canyon wall at the dam. Access to the reservoir is possible on primitive roads past the dam on the left. Boating, fishing, picnicking and camping are all allowed at this lake. Although it is a primitive area, it is possible to launch a boat here. There are no improved campgrounds in the area, but primitive camping is possible.